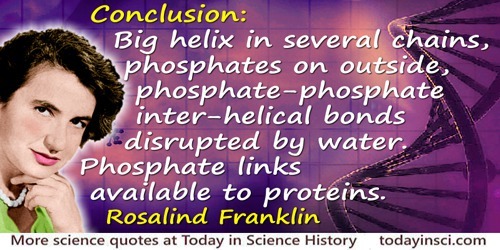 Conclusion: Big helix in several chains, phosphates on outside, phosphate-phosphate inter-helical bonds disrupted by water. Phosphate links available to proteins. Underlined in typewritten lecture notes, with handwritten annotations, as report (7 Feb 1952) on 'Colloquium November 1951'. As given in Anne Sayre, Rosalind Franklin and DNA (1975), 128. The Industrial Revolution as a whole was not designed. It took shape gradually as industrialists and engineers figured out how to make things. The result is that we put billions of pounds of toxic materials in the air, water and soil every year and generate gigantic amounts of waste. If our goal is to destroy the world—to produce global warming and toxicity and endocrine disruption—we're doing great. When legacy firms fail to innovate, start-ups jump into the market and thrive at the establishment’s expense. That’s disruption.